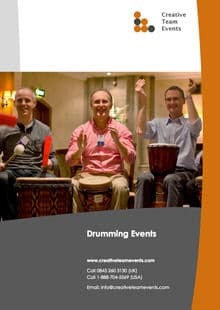 We deliver fun and unique drum workshops as a team building activity, ice breaker, energiser or corporate event. We have delivered many hundreds of workshops in the UK, USA and worldwide, with more than 20,000 participants in the UK alone. We use only the very best, professionally-trained musicians and facilitators, to leave nothing to chance. We can provide cost-effective workshop sessions in any location in the UK, USA or worldwide for groups of 5 to 5,000 and for any duration from 15 minutes upwards. Please Contact Us for more information. Over the last 15 years, we have provided workshops using drums to tens of thousands of participants worldwide. With this experience you can rely on us to deliver an unforgettable, and fun, experience for your team. We believe that we have honed the format of our sessions to provide maximum participant engagement and effective team working, all delivered in an entertaining way by our trained facilitators. No session is too large or too small for us. We have substantial experience of running large sessions with up to 5,000 participants. Equally, we’re happy to provide more intimate sessions for five or more people. We are happy to come to your location – wherever it is in the world. We will work with your choice of venue, whether this is a hotel, conference room or even your office. We bring the drums and our expert facilitators to you. Also, we pride ourselves in our flexibility, so we’re happy to work within any constraints you have in terms of time or space. We specialise in understanding the specific requirements of businesses, so we recognise that you need a company that can relied upon to deliver. Don’t just take out word for it. Please read our testimonials and view our client list. If you want to know what a drum workshop looks, feels and sounds like, please watch the following video by pressing play. Amazing drum workshops – guaranteed! In over 15 years, we have found that, more than any other activity, drum workshops break down barriers within teams, foster team building and are enjoyed by absolutely everyone. We ensure that, whatever the size of your event, every single person will be totally engaged and involved. Organisational hierarchies melt away. A typical duration for a workshop is between one and two and a half hours, although we are happy to fit within your specific time constraints. At the beginning, each participant is normally greeted by a stunning drum on his or her seat. Our highly-trained leaders introduce themselves, and teach without teaching and entertain without being patronising. In no time at all, the basics of playing are covered and the team is well on its way to creating a drumming orchestra. Different rhythms are then layered together to accomplish a percussion masterpiece. Along the way, there is lots of audience participation, both on and off the stage. Anyone can drum, and led by the skills of the head facilitator, the new ensemble gradually begins to believe in itself. We progressively add more and more ideas and sections to create the final performance. We build towards a spectacular and memorable finale, in terms of sight and sound, with a united and unified drumming orchestra – a truly inspiring, motivating and empowering sight. The feedback we receive is often all about the journey itself. “How was it possible to take a mass of people and in such a short period of time have them achieve this?” People can achieve amazing things if they are having fun, build on small successes and just have a little faith. Here at Creative Team Events, we have many styles of drumming to offer. 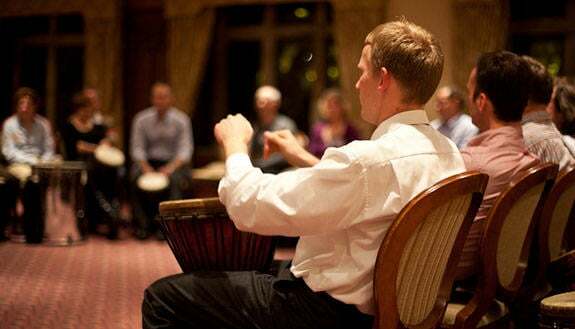 African drum workshops are among our most popular, bringing the authentic sights and sounds of Africa to your workshop. 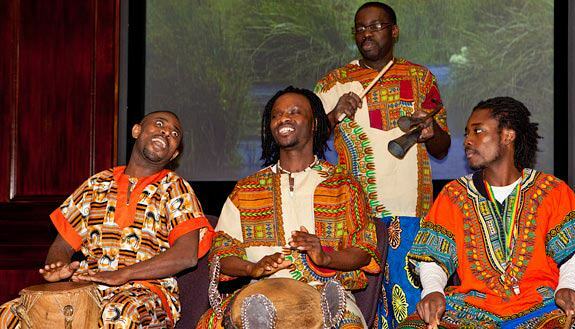 A typical African drumming ensemble will have three to six separate drum parts intertwined at one time. Each part has a crucial role and affects all the others. Your workshop will build towards a final, exciting performance. For an extra special surprise, we have a traditional group that can stun your team with their power, energy and talent. They can be introduced at the end of the event as a special finale surprise to play alongside your group. Or why not introduce them later in the day, perhaps after dinner? When our African group enters the room drumming and dancing, their performance is totally infectious. Please download our drumming workshops brochure (in PDF format), which provides further information.